Qg 2 Multi-Sync Gateway provides a flexible, high precision, resilient and scalable sync platform for assuring sync performance everywhere. Qulsar has recognized the growing importance of resilient timing and synchronization solutions, especially for indoor cellular services and where TDD frequencies are being introduced. 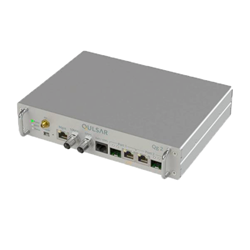 Qulsar, Inc., an industry leader in precise time synchronization solutions, announces its scalable and innovative multi-sync gateway that addresses a critical need of mobile network operators. Small cells are deployed in traffic hotspots in a variety of locations such as in urban canyons or indoors where GNSS signals are weak or unavailable for parts of the day. Qulsar’s Qg 2 provides a resilient and scalable sync platform for overcoming the challenges of GNSS. Qg 2 is a compact, easy to deploy, PTP grand master and a boundary/gateway clock that supports hybrid SyncE/PTP architectures. It integrates multiple reference sources of synchronization such as GNSS, PTP and Synchronous Ethernet to enable a low Total Cost of Ownership (TCO) solution for 4G / 5G radio access networks. Qg 2 leverages its industry leading PTP algorithms to deliver stringent timing for LTE, including LTE-A and LTE-TDD architectures in many challenging indoor and outdoor environments. It supports G.8265 and G.8275 frequency and phase profiles. This Multi-Sync Gateway features dual gigabit Ethernet ports and a small form-factor pluggable (SFP) module port for optical connections. It also provides timing interfaces for GNSS, 1 Pulse Per Second (PPS) and Time of Day (ToD) input/output. The Qg 2 can use Power-over-Ethernet (PoE) to simplify installation by utilizing standard Ethernet within a facility or the backhaul connection. It offers industry leading performance and is scalable to support 256 PTP slaves at 128 packets per second. It is designed for deployment in distributed cluster sync architectures. This involves moving timing sources close to the edge of the network in order to meet the phase and frequency precision requirements at the small cell or remote radio head (RRH). "After excelling in delivering industry leading performance through embedded solutions, the introduction of Qg 2 demonstrates Qulsar’s commitment to deliver complete end-to-end solutions in a cost-effective manner. Mobile network operators face significant challenges when deploying small cells in their infrastructure. Obtaining precise sync economically has been one of them. Qg 2 is tailored to solve this problem by delivering a simple, scalable, high performance and resilient solution that is deployable everywhere," said Rajen Datta, President and CEO of Qulsar. "Qulsar has recognized the growing importance of resilient timing and synchronization solutions, especially for indoor cellular services and where TDD frequencies are being introduced. The Qg 2 has been launched just when we can expect to see significant growth in Enterprise Small Cell deployments and will help accelerate uptake due to its cost effectiveness, scalability and resilience", said David Chambers, Founder and Senior Analyst, at Think Small Cells. Qulsar’s Qg 2 is under beta trials with mobile operators. General Availability is expected in Q3’2016. Qulsar is a leading provider of precision time synchronization solutions for Mobile Infrastructure, Industrial Internet of Things, Datacenters and the emerging Smart Grid. We generate, refine, distribute and harness precision time to enable applications and provide our customers with world leading, cost effective solutions. Visit us at qulsar.com.